Thank you for the photos. Yes, you are correct that it is definitely a cicada. A female. I am unsure of species however. At first I wanted to say Tibicen lyricen but the color pattern of the pronotal collar is green instead of black and to be honest it looks too big to be Tibicen canicularis. Any idea as to what the square area is on the post it was sitting on? That would help a lot. Also, can you provide any additional information with regards to where you snapped those photos? That is, an address of a place or nearest street? Thank you very much for the siting information. I have been getting many emails with pictures of cicadas and cicada killers. It was sitting on a fence post at 7 am. The post is about 20 years old and made of pine..A quick view of my pictures and then measuring the fence post..The front leg of the cicada is on the corner of the block, there is a large crack in the block and this crack appears in the picture behind the wings. From the corner of the block (where the front leg is) to that crack is exactly 2 and 1/8 inches. The block itself is 5 1/2 by 5 1/2. I don't know if that helps you any! I guesstimate 1 and 3/4 to 5/8 inches when I try and measure based on the pictures.. I live on Cape Cod, so that means lots of sand..In my yard there is plenty of pine, locust and a few maple. The exact spot he was found was my driveway. 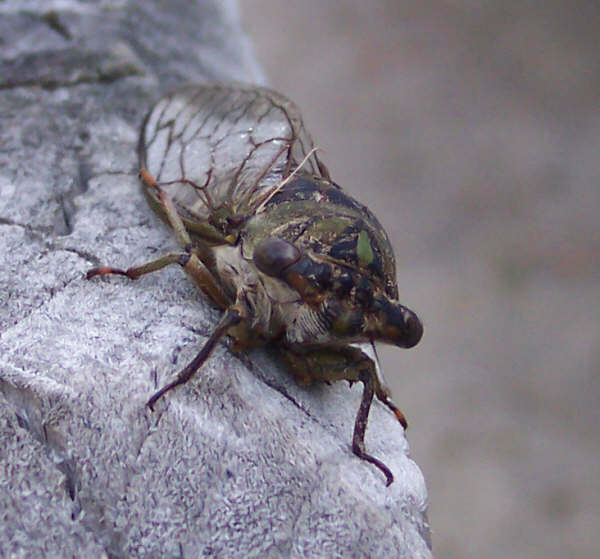 I've been researching all about cicada now, so I'll be prepared for the next time..(if there is one) as I've been obsessed about searching for them ever since reading your site. I have been listening to the sounds people have recorded and I can say that I haven't heard any yet.. Your website is fantastic. 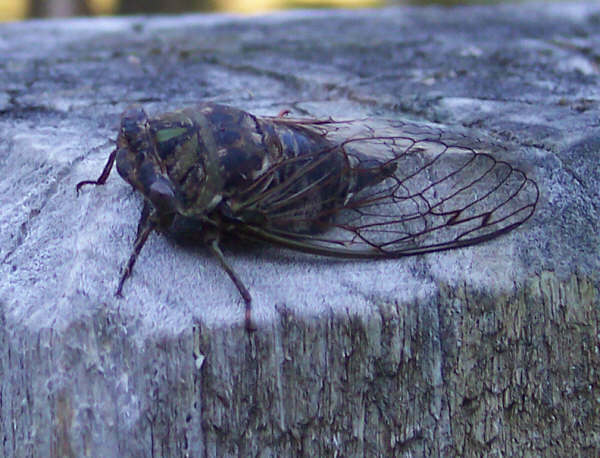 No need to reply to this unless you have any other questions..If you ever pin down what type of cicada this is..Let me know, otherwise I imagine you are so busy and I don't want to take up any more of your time. I'll be studying up on cicada now and you can count on me to keep you posted about anymore in my area!